These general conditions apply to all offers, quotations and agreements of Parkinclusive Global bv and the customer, where the applicability of any general conditions by the customer is explicitly excluded. By way of derogation of these general conditions is only possible if this has been agreed in writing in the agreement between the both parties. The current conditions apply also to all agreements with Parkinclusive Global bv where for the implementation by Parkinclusive Global bv third parties will be enabled. The voidness or voidability of one or more provisions , such as provided in these general terms and conditions, doesnot affect the legality of the other not valid or destructible provisions in these general conditions. At that time the parties shall consult in order to agree on new stipulations to replace the invalid stipulations, whereby observing the goal and meaning of the original stipulations as much as possible. Agreements will be occured at the moment that the customer will accept the offer of Parkinclusive Global bv through registration on the website, as well as the customer will agree with the orderconfirmation sent by Parkinclusive Global bv, subject to the situation that as a result of a disturbing circumstance the customer doesnot approve the orderconfirmation and/or Parkinclusive Global bv has given actual implementation to the agreement and this is known\should have been aware for the customer. Any offer to the customer made by Parkinclusive Global bv is without engagement and may always be revoked by Parkinclusive Global bv within five working days after acceptation of the customer. Verbal offers, made by Parkinclusive Global bv, will not be legally binding, unless the offers have been confirmed in writing by Parkinclusive Global bv. The customer and/or third parties can derive no rights for possible typing errors and/or misprints in offers provided by Parkinclusive Global bv. If the customer accepts the offer of Parkinclusive Global bv by booking on the website, there will be an agreement at that moment, unless Parkinclusive Global bv is unable to accept the booking of the customer, under communication to the customer, without given any reasons to the customer by Parkinclusive Global bv. The customer can made a booking through the website to one hour before the service. The bookings within one hour can only be made by telephone, after that the customer will receive a confirmation by email. The customer must approve the confirmation. The log on to the website is only possible, after the customer has indicated that he has received these general conditions and has agreed with these conditions. The customer must complete the asked data and necessary information truthfully. The customer is above the age of eighteen years. After the booking the client will receive a confirmation of Parkinclusive Global bv. If the personal details are incorrect and/or incomplete, than the customer must report this in the period up to 24 hours before the service. By subscribing to the website the customer will agree that the personal details are stored by Parkinclusive Global bv and that these details may be used to send you offers and news of Parkinclusive Global bv. The customer can unsubscribe by sending an e-mail to info@centralparking.nl. Parkinclusive Global bv shall perform the services to be provided by it to the best of its knowledge an ability and in accordance with good professional services. The commitment on the side of Parkinclusive Global bv is under an obligation to use its best efforts and not an obligation to produce results. Parkinclusive Global bv and the customer should inform each other at any time about the circumstances and developments which they need to know. The customer is responsable for the correctness and completion of the data provided by him or herself or by third parties to Parkinclusive Global bv. The customer will allow us to perform the services properly, including the delivery of relevant information requested by Parkinclusive Global bv. Parkinclusive Global bv has the right to have certain work performed by third parties without permission of the customer. The customer isnot authorised to carry out work by him/herself or by third parties, that would include or may belong to the command of Parkinclusive Global bv. At the moment of entering into an agreement the customer has to inform Parkinclusive Global bv about the drop off and pick up time. 24 hours before our service it is allowed to change the date and time. In case of unforeseen circumstances, such as changing flight times, the customer has to inform Parkinclusive Global bv as soon as possible before the service by writing, via e-mail info@centralparking.nl or by telephone. The customer has to inform Parkinclusive Global bv 25 minutes before the service by telephone on the telephone number given by Parkinclusive Global bv about the time that Parkinclusive Global bv can take the vehicle. Parkinclusive Global bv will do his utmost to receive the vehicle at the desired time. However it is allowed for Parkinclusive Global bv to exceed the time up to 30 minutes. This does not apply if there is force majeure or unforeseen circumstances like delay in flight time and/or (start) defects in het vehicle and/or traffic conditions whether or not a result of Government measures. Parkinclusive Global bv will take a vehicle into safekeeping, if the payment will take place in accordance with the reservation. If the payment has not been done yet, the customer must still comply with this obligation by means of cash payment or pin during the delivery of the vehicle. If there is no payment, Parkinclusive Global bv will not take the vehicle in safekeeping. At the moment the customer gives the vehicle in safekeeping, Parkinclusive Global bv will record the condtion of the vehicle and will take pictures of the vehicle and shall record this on the return form and the customer will put his/her signature on the form. Parkinclusive Global bv notes only the damage that is not covered by the user damage. The user damage is defined in any case, but is not limited to wastage, scratches and/or damage, which are common given the age and mileage of the vehicle. All employees of Parkinclusive Global bv have a company ID card. The customer is solely responsible for checking the pass and for returning the vehicle to the employees of Parkinclusive Global bv. At the moment the customer receives the vehicle, the customer has to inspect the vehicle directly for possible damage or changes in comparison with the time of delivery of the vehicle. Parkinclusive Global bv shall never be liable for the damage to the vehicle that is recorded on the return form. If there is any damage of the vehicle that is not recorded on the form, the customer has to note this on the receipt form signed by him/herself, in the absence of which the customer processes his/her rights to complain and/or claims under possible damage towards Parkinclusive Global bv. Noted that Parkinclusive Global bv is only responsible for damage to vehicles subject to what is provided in article 10 of these general conditions. At the receipt of the vehicle, the customer has to show his/her part of the agreement and an ID card to the employee of Parkinclusive Global bv. Parkinclusive Global bv is entitled to make a photocopy of this ID card. If the customer can not show his/her ID card, than Parkinclusive Global bv is entitled to not to return the vehicle to the customer, until the client can identify. The customer is obliged to ensure the vehicle against all risks/casco and to keep the vehicle ensured during the agreement, unless the customer can prove that it is not possible to ensure the vehicle. to ensure that all equipment (electronics) in the vehicle is turned off at the moment the customer delivers his vehicle to Parkinclusive Global bv. If the vehicle of the customer is not working or does not start during the period of safekeeping, the costs and risks will be entirely for the account of the customer. at the moment of delivery of the vehicle to check the identity of the employee of Parkinclusive Global bv by showing his/her company card. If the customer hands over his/her vehicle to an employee who can not show his company card, than this is fully for the account and risk of the customer. to leave no valuable items in the vehicle. Complaints about the service must be reported at the receipt form (signed by the customer) when returning his/her vehicle. Within fourteen days after signing the receipt form Parkinclusive Global bv will respond in writing to the complaint to sending a response to the email address specified by the customer. If the complaints are well founded, in the opinion of Parkinclusive Global bv, Parkinclusive Global bv will compensate the customer in all reasonableness. The compensation will never exceed the amount the customer has paid to Parkinclusive Global bv for the service. The prices and rates of the services applied by Parkinclusive Global bv are listed on the website or in the confirmation email sent by Parkinclusive Global bv to the customer, if the customer does not book via the website. Payment must be made in Euro during the booking via de website or within 3 calender days after receipt of the confirmation mail into the bank account designated by Parkinclusive Global bv. Bookings within 24 hours for implementation of the service are only considered, if payments are made within 2 hours after receipt of the confirmation mail of Parkinclusive Global bv to the customer. Objections against the amount of the invoice do not postpone the payment obligation. The customer shall not be entitled to deduct the (possible) amounts to Parkinclusive Global bv against the possible claims of the customer on Parkinclusive Global bv. If the invoices are not settled on time, the customer is liable for the legal interest under the law. In case of liquidation, bankruptcy, repossession of moratorium of payment of the customer or the customer loses free control over his/her assets or loses the power of disposition of his property, the claims of Parkinclusive Global bv against the customer shall be payable immediately. If Parkinclusive Global bv is forced to take action by non-payment by the customer, in order to obtain the payment, the related extrajudicial costs are at the expense of the customer. The extrajudicial costs will be determined on the basis of the BIK-scale. The payment of a certain amount serves first of all for the payment of the costs, then the payment of outstanding interest and after all the payment of the principal som and the accrued interest, regardless there are other instructions given by the customer upon the payment. If the customer comes back later than planned and/or the term of agreement is extended, the customer must inform Parkinclusive Global bv by email, sms or telephone. Parkinclusive Global bv will charge the customer extra Euro 7,50 per day. An earlier return than planned and/or a shortening of the term of agreement gives no fund of an amount already paid by the customer and/or a discount on a even amount to be paid by the customer. Parkinclusive Global bv shall never be liable for the damage which the customer suffers, if the customer has not reported the damage on time which is written in article 6 of these general terms and conditions. Parkinclusive Global bv shall never be liable for the damage which the customer suffers, if this damage will be reimbursed by the insurer. Parkinclusive Global bv shall never be liable for the damage which the customer suffers or will suffer as a result of (burglary) damage to the vehicle or theft as well as misappropriation of the vehicle that the customer has given in safekeeping, unless the customer proves that the damage has occurred during the period of safekeeping, Parkinclusive Global bv doesnot comply the care of a good custodian and the damage suffered by the customer is the result. Parkinclusive Global bv shall never be liable for the damage suffered by third parties as a result of the implementation of the agreement, unless there is a question of intention of deliberate recklessness from the side of Parkinclusive Global bv. Parkinclusive Global bv is not liable for damage of car windows. As far as Parkinclusive Global bv is liable for damage, then it concerns just a direct damage and the liability is limited to a maximum amount paid out by the insurer of Parkinclusive Global bv minus to bear our own risk amount. The reasonable costs incurred in prevention of limitation of damage, to the degree that customer can demonstrate that these costs have led to the limitation of the damage as referred to in these terms and conditions. Parkinclusive Global bv shall have no liability for indirect damage. Parkinclusive Global bv shall have no liability for damage caused by incompleteness and inadequacy of information provided by or on behalf of the customer. When it shows that the damage claimed by the customer was already on the vehicle at the moment that the vehicle had been delivered to Parkinclusive Global bv, Parkinclusive Global bv will charge handling costs of Euro 78,68 (excl. VAT) according to the convenant of regulations of administrative costs (article 10 of the convenant). Parties are not obligated to fulfill any obligations under the agreement, if they are hindered to do so as a result of a circumstance that is not not attributable to their fault not is attributable to them under the law, legal act or generally accepted practices. In these general terms of conditions, the term “force majeure” by Parkinclusive Global bv will be taken to mean – in addition to its definition in law and legal precedent – all external causes, foreseen of unforeseen, which Parkinclusive Global bv cannot influence, but as a result of which Parkinclusive Global bv is unable to perform its obligations. This shall in any case include workers strikes of employees of Parkinclusive Global bv and/or (sub)contracted personnel. If it is impossible for Parkinclusive Global bv to comply its obligations by the existence of the force majeure, each party will be entitled to terminate the agreement for the portion of the obligation that have not yet been met, with the other party having any claim to compensation. To the extent that, at the time when force majeure takes effect, Parkinclusive Global bv has complied with his service, however much earlier than the agreed period, Parkinclusive Global bv has to stop the services due to force majeure, Parkinclusive Global bv is entitled to invoice separately for the said part to the customer. In this case, the customer is obliged to pay this invoice as thought it is a separate agreement. The customer is entitled to cancel the agreement free of charge at least twenty-four hours before our services. If the customer cancels during the period from twenty-four hours to the implementation of the service or the customer doesnot appear at the agreed time (no show), the customer must pay the entire payment agreed by Parkinclusive Global bv. Parkinclusive Global bv owns all rights of intellectual property of her brand names and logos, trade and domain names that are documented on the website (www.centralparking.nl). The customer shall not be allowed to use these goods, to copy, to multiply and/or to expose, unless Parkinclusive Global bv must provide written permission in advance. Customer shall safeguard Parkinclusive Global bv against possible claims filed by third parties who may sustain damage attributable to someone other that Parkinclusive Global bv in connection with the execution of the agreement. If Parkinclusive Global bv therefore should be approched by third parties, the customer is required to assist Parkinclusive Global bv both judicial and extrajudicial and to do all that could be expected from him/her in that case. Should the customer remain in default in taking adequate measures, then Parkinclusive Global bv is entitled to proceed thereto itself without proof of default. All costs and damage that has thereby occurred at the side of the customer and third parties are integrally at the expense and risk of the customer. All agreements between Parkinclusive Global bv and the customer is governed exclusively by the law of the Netherlands. All disputes arising from the agreements, which Parkinclusive Global bv concludes with the customer or implementation shall be settled by the competent Court of Amsterdam. Since from what under article 9 (2) of these terms and conditions is provided, Parkinclusive Global bv reserves the right to hand over the customer to the competent judicial authority of the residence or registered office of the customer. By way of derogation of these general condtions is only possible if this has been agreed in writing in the agreement between the both parties. The current conditions apply also to all agreements with Parkinclusive Global bv where for the implementation by Parkinclusive Global bv third parties will be enabled. Parkinclusive Global bv has the right to have certain work performed by third parties without permission of the customer. The customer is not authorised to carry out work by him/herself or by third parties, that would include or may belong to the command of Parkinclusive Global bv. At the moment of entering into an agreement the customer has to inform Parkinclusive Global bv about the drop off and pick up time. 24 hours before our service it is allowed to change the date and time. In case of unforeseen circumstances, such as changing flight times, the customer has to inform Parkinclusive Global bv as soon as possible before the service by writing, via e-mail info@centralparking.nl or by telephone. The customer has to be note that he/she has to taken sufficient time for the Shuttle Service and the connection with the referent flight. In principle you need a minimum time of 30 minutes after departure of the parking area, before the departure of the transfer. Nevertheless, Parkinclusive Global bv is not liable for missing your flight and other damages by falling short of assessing the related (flight) connections. Waiting times occur and this should be taken into account. We recommend to park your vehicle at least three hours before departure of your flight and in summer time at least four hours before departure of your flight. At the moment the customer gives the vehicle in safekeeping, Parkinclusive Global bv will record the condition of the vehicle and will take pictures of the vehicle and shall record this on the return form and the customer will put his/her signature on the form. Parkinclusive Global bv notes only the damage that is not covered by the user damage. The user damage is defined in any case, but is not limited to wastage, scratches and/or damage, which are common given the age and mileage of the vehicle. The reasonable costs made in determining the cause and the extent of the damage for as far the cause is related to damage in sense of these terms. Video: How does Valet Parking work? Why Should You Choose Centralparking? I'm Charles, the driver (valet) that will be meeting you at Schiphol, Rotterdam or Eindhoven airport or at the Passenger Terminal Amsterdam. I'll make sure that your car is properly parked at our secure parking facilities and that your car is returned to you safe and sound. Parking at Dutch Airports and Cruise terminals can be quite expensive. More and more people are discovering the advantages of Valet Parking when departing from Schiphol, Eindhoven Airport, Rotterdam Airport or the Passenger Terminal Amsterdam. You can drive directly to the departure terminal, where one of our drivers will meet you. They will then drive your car to one of our secured parking premises outside the airport or cruise terminal. Upon your retu, one of our drivers will be waiting for you with your car. You can then quickly be on your way home or to the office. Whether you opt for long or short-term parking at the airport or cruise terminal, valet parking always offers fast service using professional drivers. We have drivers available 24/7 to offer you prompt assistance. And if you need last-minute parking service, we will also be able to help. With 7 years’ experience in offering professional valet parking services throughout the Netherlands, we now provide valet parking to hundreds of travellers every day. Centralparking offers valet parking services at Schiphol Amsterdam Airport, Eindhoven Airport, Rotterdam, The Hague Airport and the Passengers Terminal Amsterdam. Every year, tens of thousands of travellers use Centralparking’s outstanding valet parking service. These customers choose Centralparking because it allows them direct access to the departure area of the airport or cruise terminal, with no hassle: there’s no need to look for a parking spot – we simplypark your car for you. And on your retu, your car will be waiting for you in the same place, allowing your travel home to start immediately. Our customers are willing to pay a fair price for a professional parking service at the airport or cruise terminal. Centralparking has 7 years' experience and parks nearly 80.000 cars annually. 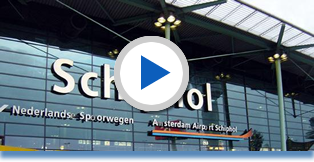 Centralparking is fully insured at every Valet Parking Service at Schiphol. Regardless of the make or model, your car will be handled with the utmost care. We are continuously training our employees to be safe and courteous drivers. We are proud of our long term cooperation with various airlines and travel agencies who endorese the same high standards of service.